Gordon Brown has brought a new team into Downing Street to replace Tony Blair's old inner circle. Some will be well-known faces inside the Cabinet, others will be advisers. Here are some of the names to look out for. Sometimes known as Mr Brown's representative on earth. In fact, many suspect the Normanton MP and former chief economics adviser at the Treasury actually hails from another planet altogether where his famous phrase about "post neo-classical endogenous growth theory" is actually understood. Mr Brown understood it well enough so it is no surprise the two are the closest of colleagues. Mr Balls is one of the big figures in the Brown inner circle and has been rewarded with the job as secretary of state for children, schools and families. Mr Balls' wife and MP for Pontefract is a former journalist and housing minister who somehow managed to escape any consequences from the shambles surrounding her Home Information Packs policy. Another rising star who, nonetheless, many believe still needs to prove herself. She has been given the chance to do that by continuing as housing minister but now attending cabinet when required. His brother David may have been the more favoured under Mr Blair and will continue his rise under the prime minister, but Ed served as Mr Brown's special adviser and is bound to flourish under his rule having been given his first job as cabinet office minister. Some have suggested that, of the two brothers, he is the one to watch in the long term. Should be some good, friendly sibling rivalry at least. 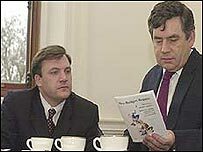 Mr Austin first made a name for himself as Mr Brown's spin doctor in the wake of Charlie "would I lie to you?" Whelan. He is now MP for his home town of Dudley, which explains the Ozzy accent, and is bound to be kept close to the prime minister as his parliamentary private secretary. A former Treasury man who went to work as Tony Blair's principal private secretary from 1999-2003 (although it is said Mr Brown tried to talk him out of it). He has been brought back from the City as head of domestic policy in the Cabinet Office, which means he will be Mr Brown's top policy hit man in Whitehall. Another, you guessed it, Treasury man who has become Mr Brown's all-powerful chief of staff. Mr Ellam is the prime minister's official spokesman, taking over from Tom Kelly who took over from Alastair Campbell. But forget any return to Campbell-style briefings, Mr Ellam is a civil servant through and through. It hardly needs saying he is being brought across from the Treasury. Mr Livermore has been appointed director of political strategy, one of the key jobs in Downing Street. He joins the list of those crossing the road from the Treasury where he was a special adviser on policy. Mr Corry has been appointed head of the Downing Street policy unit. He apologised for the incident and it was widely regarded as out of character. Yet another Treasury man, Mr Cunliffe was head of finance regulation there but has been appointed as Mr Brown's head of international economic affairs, Europe and G8 Sherpa (the people who do the deals before the big summits). The other main foreign post goes to Simon McDonald who is head of foreign and defence policy. He was Mr Brown's spin doctor at the Treasury, having taken over from Ian Austin. He is likely to remain in the background as an adviser, briefing editors and selected journalists. It will be his behaviour, rather then Mr Ellam's, that is most likely to set the spin-or-no-spin tone of the new administration. One of Mr Brown's closest, most respected and, it is said, intimidating economic advisers at the Treasury. A former director of Warburg she will remain close to the prime minister in her job as minister in the international development department. She has been with Mr Brown since the year zero and acted as his personal adviser and gatekeeper - if you want to get to Gordon you go through her. Married to ex-BBC chairman Gavyn Davies, who resigned after the Hutton Inquiry, she introduced Mr Brown to his wife, Sarah.